The food cart on Lafayette Street this morning looked like any other -- except, of course, for the rockstar chef who was cooking lobster behind it. Momofuku's David Chang stepped out of his kitchen and into the streets today to cook free lunches for 200 lucky locals. Chang, the genius chef often described as New York City's "Noodle King," put his culinary chops to work, serving up his signature pork buns, smoked chicken wings and ginger rice noodles -- all out of a food cart. 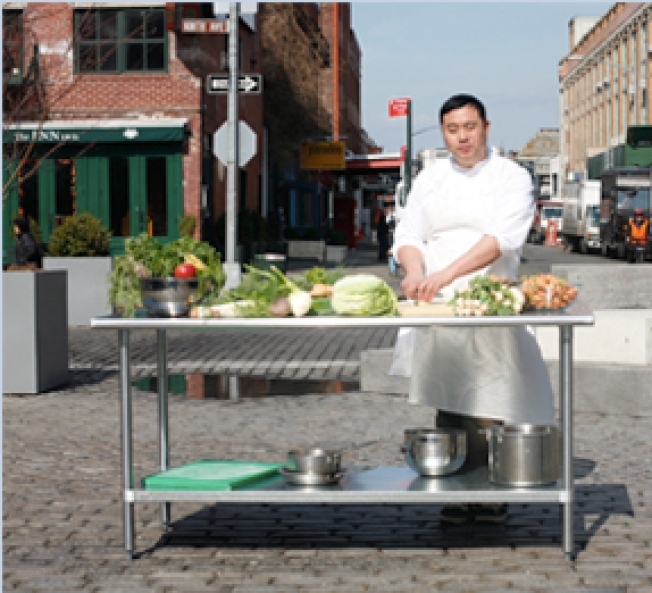 "We're really excited to do this, because we don't really have a street food culture here in New York," Chang said. "We do have street food, but it's not as diverse as you'd expect for a place like New York City." "In Thailand and other parts of Southeast Asia, some of the best food is from the streets, literally," he said. Chang and his Noodle Bar crew hoped to add a little variety to the typical Manhattan street cart menu of hot dogs and shawarma. The experiment was part of an NBCNewYork.com's Locals Only Underground Events, in which guests received invitations to dine after completing an on-line quiz about New York City. Chang and his crew set up shop at the corner of Lafayette and East Houston for the event, which ran from 11 a.m. to 3 p.m. Two picnic tables seated about a dozen guests, while others sat on the ground. Adventurous customers ordered the mystery dish "Dealer's Choice," which included duck rillette (pulled duck meat) and lobster and grits with poached eggs, scallions and crispy ham chips. The free meal also included dessert: soft-serve ice cream made from organic ingredients in Chang's Manhattan restaurants, which include the Momofuku Noodle Bar, Momofuku Ko, Momofuku Ssam Bar and Momofuku Bakery and Milk Bar. Keith Fujiu and Chau Le, both Columbia Law students, were among the first to arrive. "I really like the idea," Le said of bringing a renowned chef to the streets. "It's really about David getting down to what he likes to do and what he's good at -- food that's simple and pedestrian, super fatty but doesn't make you feel gluttonous." Le, who ordered the Dealer's Choice and got lobster, said the dish was beyond anything she'd expected from a street cart. Momofuku's David Chang said he expects a hectic scene when he cooks for you on the street one of these days, right over at the intersection of . . .
Tasha Blackman, who stopped by on her lunch break, had a similar reaction to Chang's food cart creations. "The food was amazing. Everything worked really well together," she said. "I love that we're all sitting on a sidewalk eating food made from fresh ingredients in a way you'd never expect," Blackman added. "You've got your hot dogs and roasted nuts, but you'd never think of poached eggs and lobster on the side of the street."